SRTHub is a cloud-based service for routing low-latency, secure and reliable media for broadcast contribution, production, and distribution workflows. SRTHub is the ideal solution for broadcasters seeking alternatives to costly satellite links, purpose-built fiber networks, or proprietary transport solutions. When news is breaking, broadcasters need fast, on-demand ways of getting their content from the field to production, even from unexpected locations worldwide. SRTHub helps broadcasters and video service providers easily build live and file-based content routing workflows on-demand, with security and reliability. 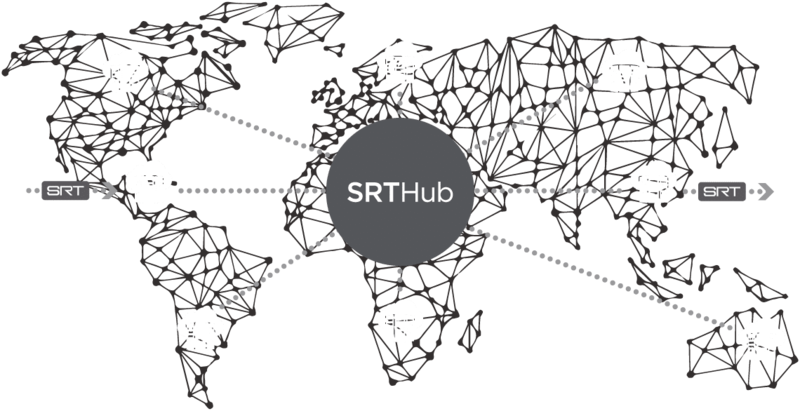 SRTHub features seamless routing and control, an open partner ecosystem, and the scalability and reach of the global Azure network. Not all clouds are created equal. Leveraging the global reach of Microsoft Azure and their 54 worldwide data centers (regions), SRTHub ensures that the challenging first-mile hop to the cloud is always as short as possible no matter where events are happening. SRTHub removes the complexity of spinning-up regional cloud resources and determining the best path through the internet. Leveraging the latest Microsoft Azure cloud architecture, SRTHub automatically provisions the processing resources (containers) required in any data center to intelligently scale and route media from source to destination. SRTHub can automatically route media into and out of third-party broadcast systems through the use of connectors called Hublets to extend the platform’s capabilities. Hublets are designed to support live-to-live, live-to-file, and file-to-file workflows for delivering content to cloud service/microservice or on-premise systems. Whether delivering a live feed to cloud storage for collaborative editing or to production suites at the broadcast center, SRTHub is the fastest and easiest way to bring content in from the field and get it to air quickly. SRTHub is adaptable to specific workflow needs. Based on an open and documented framework, developers can create Hublets to provide input and output media translation, metadata alignment, user access, and control. With Hublets, broadcasters can connect multiple solution vendors in a unified workflow.